As a small speech therapy clinic servicing the South Bay areas of Manhattan Beach and Hermosa Beach, as well as the Menifee area of the Inland Empire, we are always working hard to connect with families that could benefit from our services. We know our speech therapy clinic has something unique to offer our clients—quality, personalized, in-home speech therapy—but it can be difficult to communicate it outside of our own network. That’s why we are so grateful when outside organizations publicly recognize us and help spread the word about our small business and the important work we are doing in the lives of children and families. Recently, Lil’ Chit-Chat owner Sabrina Conway was contacted by VoyageLA, an online publication dedicated to sharing the stories of the people and businesses that make Los Angeles unique. They wanted to interview Sabrina to find out more about her as a small business owner, and also to learn more about Lil’ Chit-Chat and how it’s making an impact in the South Bay. The interview, which you can read here, allowed Sabrina to talk about her approach to speech therapy and how she has turned her experience and passion into a thriving business. She also talked about how Lil’ Chit-Chat caters to the specific needs of its clients, and also offers some unique programs, like online speech therapy and a Parent Enrichment Program. We want to thank VoyageLA for taking the time to get to know Sabrina and Lil’ Chit-Chat, and for shining a light on small businesses that are doing great work throughout the Los Angeles area. Lil’ Chit-Chat was also recently recognized for the work we are doing in the Menifee area with our speech therapy clients. 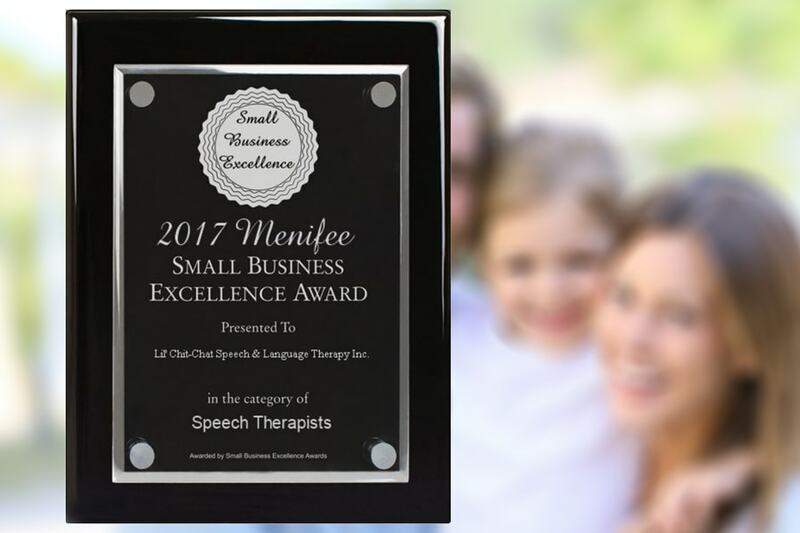 The Menifee Small Business Excellence Award Program chose Lil’ Chit-Chat to receive the 2017 award for speech therapists in Menifee! We work hard at making sure our business is an asset to the communities in which we are located, and we are grateful to the Menifee Small Business Excellence Award Program for recognizing Lil’ Chit-Chat as a business that is making the city of Menifee a better place to live and work! If you are looking for a pediatric speech therapist in the South Bay, or in south Riverside County, we would love to talk with you. Our speech therapists have experience working with children with all types of speech and language challenges and can develop a personalized plan for your child that addresses his or her specific needs. Contact us today to have your questions answered or to set up an appointment for an evaluation.